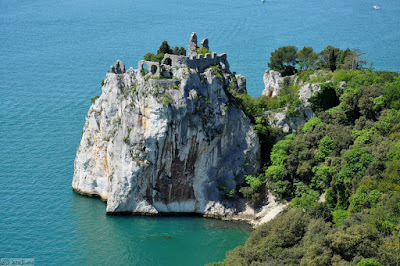 Castle Duino perches high on a rock above the Adriatic Sea, not far from Trieste in the region where Italy, Austria and Croatia come together in a jumble of islands and cliffs. 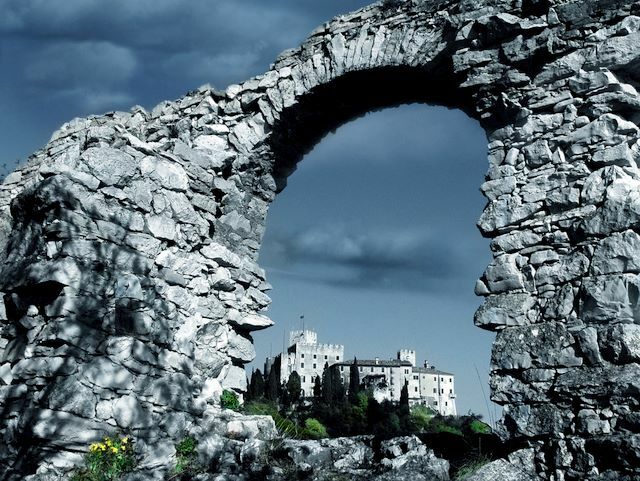 The first castle in this location was built in the 11th century by the Patriarch of Aquileia; now it is a picturesque ruin. Sources on the castle report that Dante stayed here for a while after he was exiled from Florence in 1301; but Dante's exile is poorly documented and placing him in various spots has been an Italian sport since Boccaccio did it in the Decameron, so I leave readers to make their own judgments about this particular story. The old castle was abandoned in 1389 when the new castle was built. (View of the new castle from the old.) Construction of the new castle was ordered by a certain Hugh, the Captain of Trieste, about whom I can find out nothing. He died not long after construction was began and it was completed by his son in law, Rambert of Walsee. From the Walsees the castle somehow passed to the Habsburgs, and really "somehow passed" is the best I can do; English wikipedia employs this splendid formulation: "Over time, the Wallsee family disappeared and the castle, after having been used as a prison, became the residence of the Luogar and Hofer." 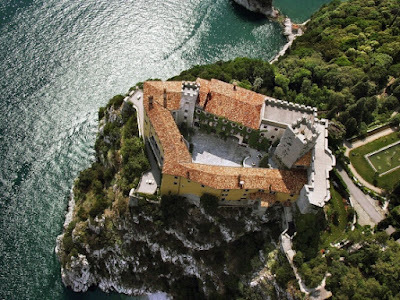 Italian sources explain that the castle was granted to Hofer von Hoenfels sometime in the later fifteenth century. The castle has belonged to members of that same family ever since, although the names have shifted around because of inheritance by women. Since 1875 the owners have gone by the name of von Thurn und Taxis. This is one of the most famous noble houses in contemporary Europe, widely covered by the scandal press; current members include an editor of Vogue and a character known in her youth as the "Punk Princess." I find the coat of arms of this family fascinating. This crazy mishmash results from the old habit of "quartering" arms, that is, dividing the shield into four parts and putting the father's arms in two quadrants and the mother's in the other two. (As in the English royal arms and the flag of Maryland.) 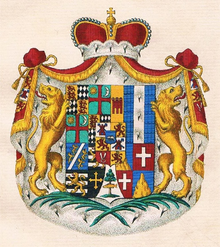 But von Thurn und Taxis has so many noble ancestors they feel they have to honor that their shield ends up like this. Close-up of the center, which shows the family's origin. 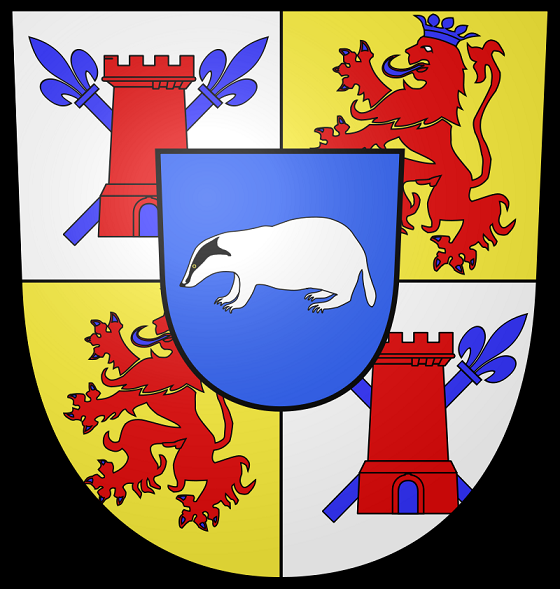 The "Taxis" part comes from the Italian "Tasso", that is, Badger, Thurn is from the German for Tower, and the lions represent the principality of Regensburg. The Tassos came from Milan and rose to prominence in the 15th century by organizing Italy's first reliable postal service, connecting Milan, Venice, and Rome. They later entered the imperial service and set up courier services connecting Madrid and Vienna to the Low Countries, Paris and London as well as Italy. 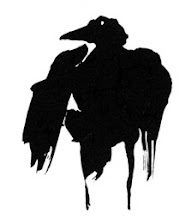 From there they passed into the pages of Thomas Pynchon's novel, The Crying of Lot 49, which posits the von Thurn und Taxis postal service as a sort of underground, alternative power center to Europe's nation states, and no it doesn't really make any more sense in the novel. Great paranoid atmosphere, though. But back to Castle Duino. In Europe's golden era the mistress of the castle was Princess Marie of Thurn and Taxis (née princess of Hohenlohe). She was a great patroness of the arts and among her proteges (and visitors to the castle) were the composers Dvorak and Smetana. 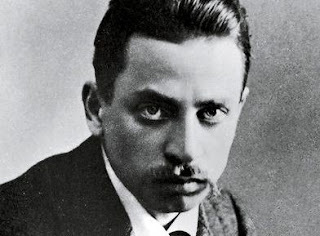 In 1912 she had as her guest the German poet Rainer Maria Rilke, who had fallen into a deep depression and not written anything for more than a year. With her help he finished his autobiographical novel, which has been splendidly summarized as "in which a young poet is terrified by the fragmentation and chaos of modern urban life." 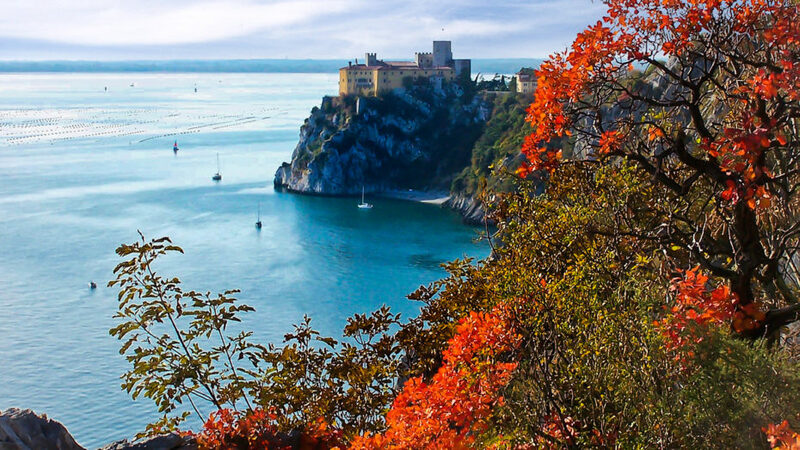 While walking along the cliffs near the castle he had the inspiration that became in time the cycle of poems known as the Duino Elegies. He heard, he said, a voice calling him from the mist, saying Wer, wenn ich schriee, hörte mich denn aus der Engel Ordnungen? ("Who, if I cried out, would hear me among the hierarchies of angels?") which is the first line of the cycle. Today you can walk the "Rilke Path" if you like, and hope that the mist will inspire you to write a famous literary masterpiece. 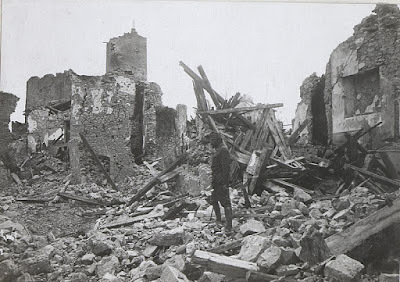 Then, horribly, awfully, sadly-beyond-words, World War I came. 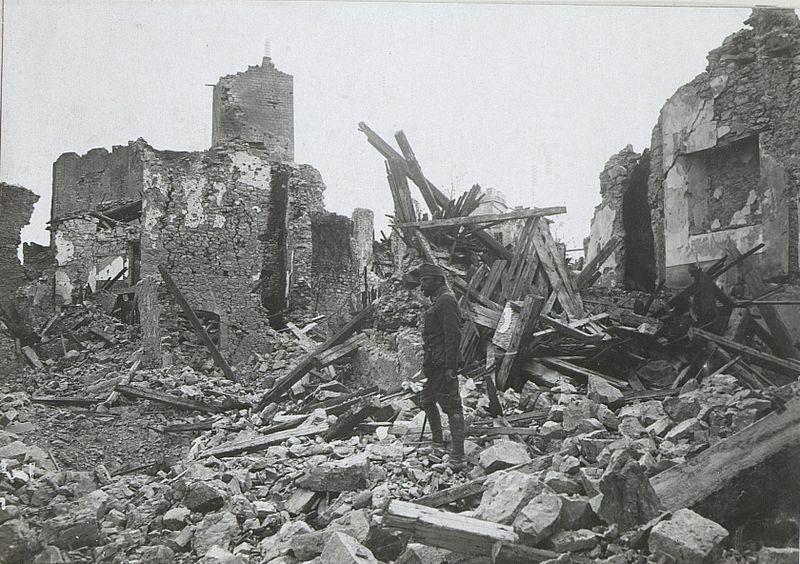 Standing near the border of Italy and Austria, the castle was caught up in the fighting and almost completely destroyed. 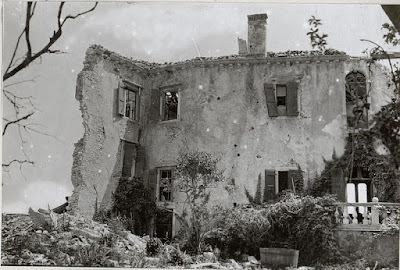 This bit of the castle's history has been effectively buried and goes unmentioned on the castle's own web site and on English and Italian wikipedia. But the owners, now transformed back into Italians by the magic of the Versailles Treaty, seem to have come through the war largely unscathed, and they immediately set about rebuilding the castle as much like it was before as they could manage, although presumably with better plumbing and wiring. The castle remains in private hands but for twenty years or so it has been open to tourists and available for spectacular weddings and the like. Seems like an amazing place. I will close with a bit of the Duino Elegies. 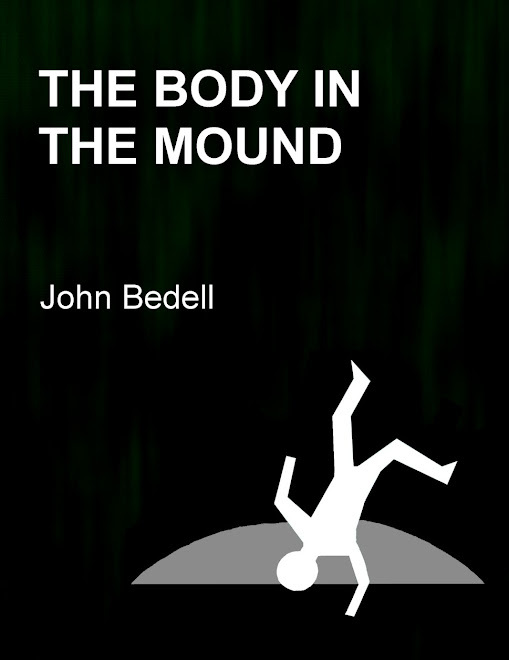 These are difficult, very intellectual poems, hard to translate from German, and so not widely read. But some intellectual agnostics consider them among the most profound meditations ever authored on the question of how to live in a world without faith. to have been of the earth can never be taken back. The promoters of the castle have take one line from this as their motto: Hiersein ist herrlich, being here is the wonder.